AMOREPACIFIC MOISTURE BOUND Sleeping Recovery Mask, 3.4 oz. AMOREPACIFICMOISTURE BOUND Sleeping Recovery Mask, 3.4 oz. 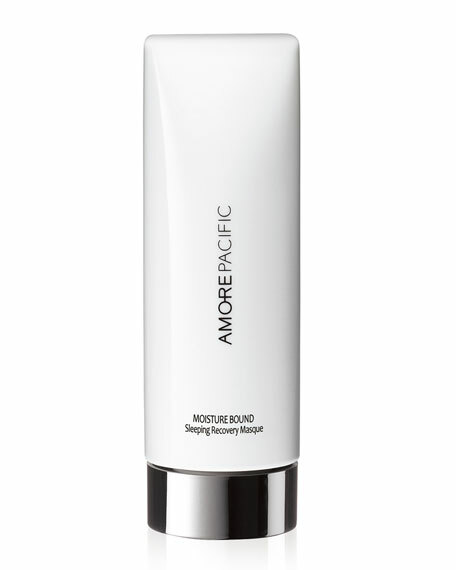 AMOREPACIFIC MOISTURE BOUND Sleeping Recovery Mask: The ultimate overnight treatment for a true beauty sleep. The best time for skin to recover from damage and stress is during sleep. This lightweight, overnight masque, formulated with 5-Hydra Complex, is a potent blend of Asian Botanicals that delivers maximum hydration and fortifies skin's natural protective barrier as you sleep. Exclusive Self-Transforming Technology ensures that skin maintains maximum moisture while you sleep. Replenish moisture as you sleep. Helps accelerate skin turnover cycle. Awaken to fully recovered, vibrant skin. Natura Bisse Oxygen Finishing Mask, 2.5 oz. Natura Bisse Stabilizing Cleansing Mask, 7 oz.